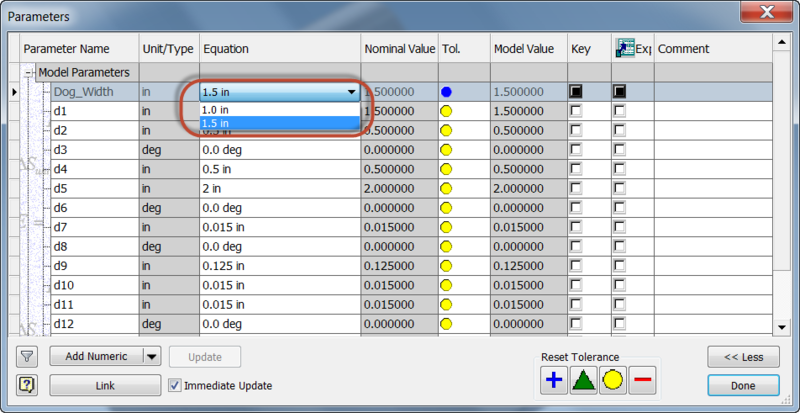 When I meet and Autodesk Inventor user, I'm often asked, "Do you know how to change behavior "X", in Inventor?" Sometimes I know the answer, sometimes I don't know the answer, and sometimes, I just have to give it a go! Earlier this week, was one of those times. The question was "When I click on the View Cube to change a view, Inventor zooms out, do you know how to change that?" The Inventor user asking the question had a good reason to ask. The assemblies she worked on were large in dimension, and when rotating on the view cube, Inventor would zoom out, forcing her to zoom back into the area she was originally working on. But I said, "Let's give it a go!" Fortunately, the solution isn't that difficult. It's within easy reach. 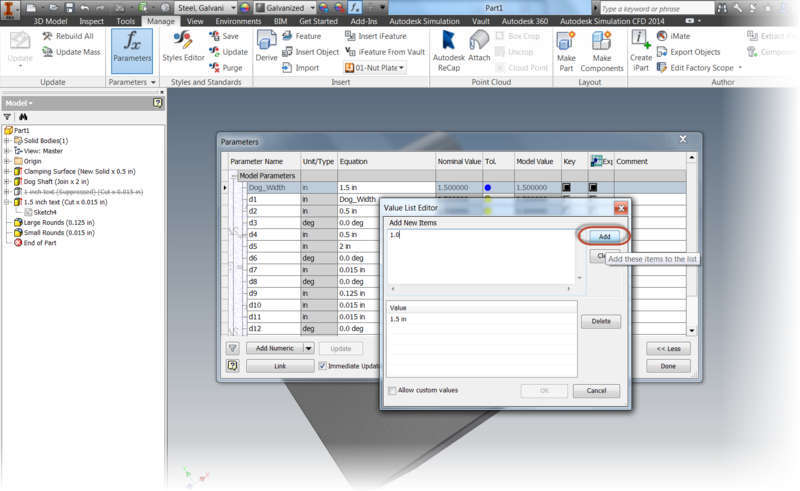 The first step, is to right click on the View Cube, and choose "Options". 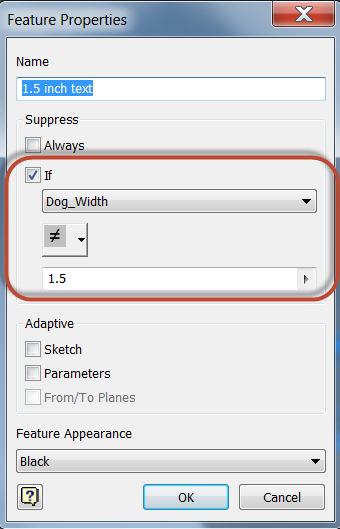 This will open the View Cube Options dialog box. When the dialog box opens, find the "Fit-to-View on view change" options, and uncheck the option. Unchecking "Fit to View on view change"
Now, when clicking on the View Cube, the zoom factor won't change. This means that the amount of zooming goes way down. Now a few pans will keep the area in view and centered. Note the images below where I used this new setting. 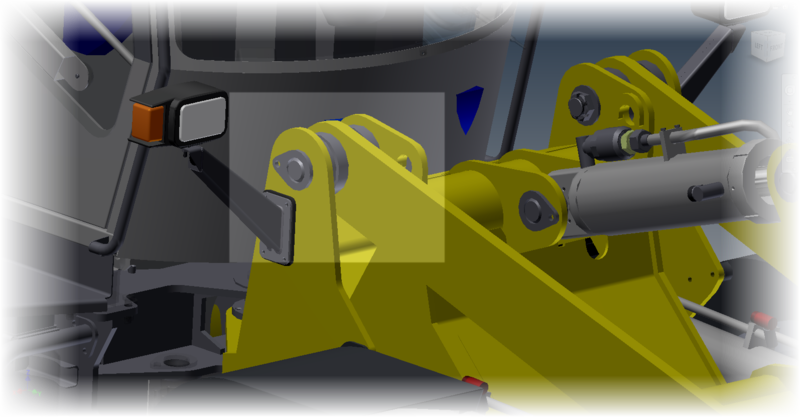 I've used the View Cube to rotate the view in Inventor, without correcting it using the Pan tool. Also notice the location of the area in the box. It stays in view now. All it takes is a quick pan to center it, and your back in the 3D Modeling game! Now brings me to here! 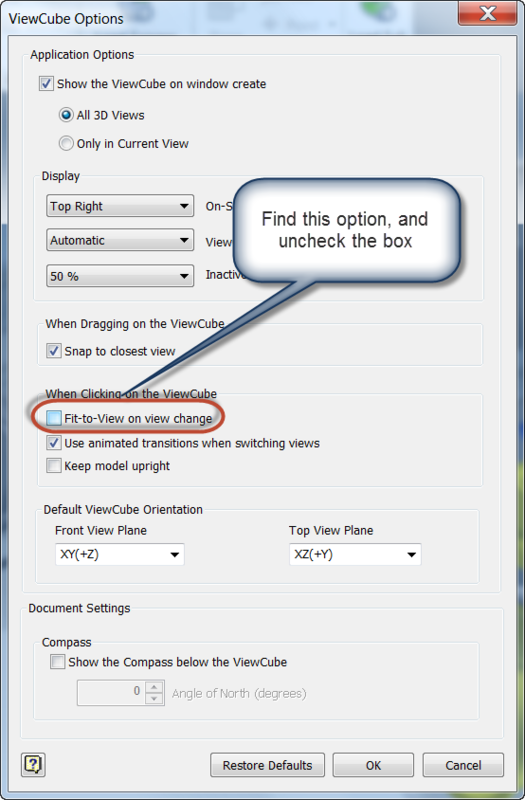 Take a look at this option if you're a big user of the View Cube. 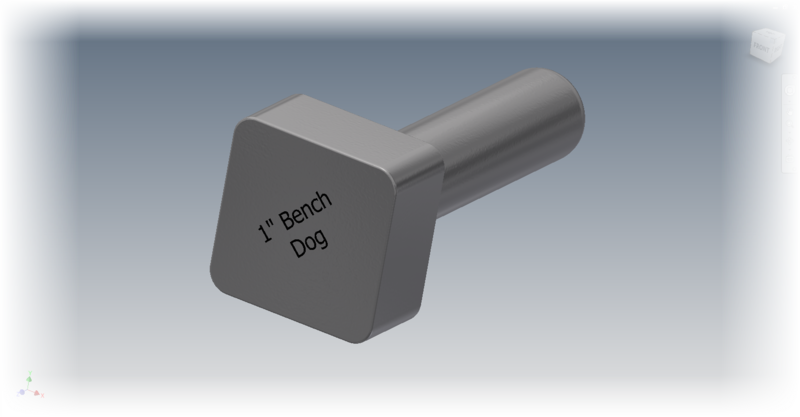 You just might find it's an easier way to work with Inventor. And if you prefer this tip in video form, take a look below! 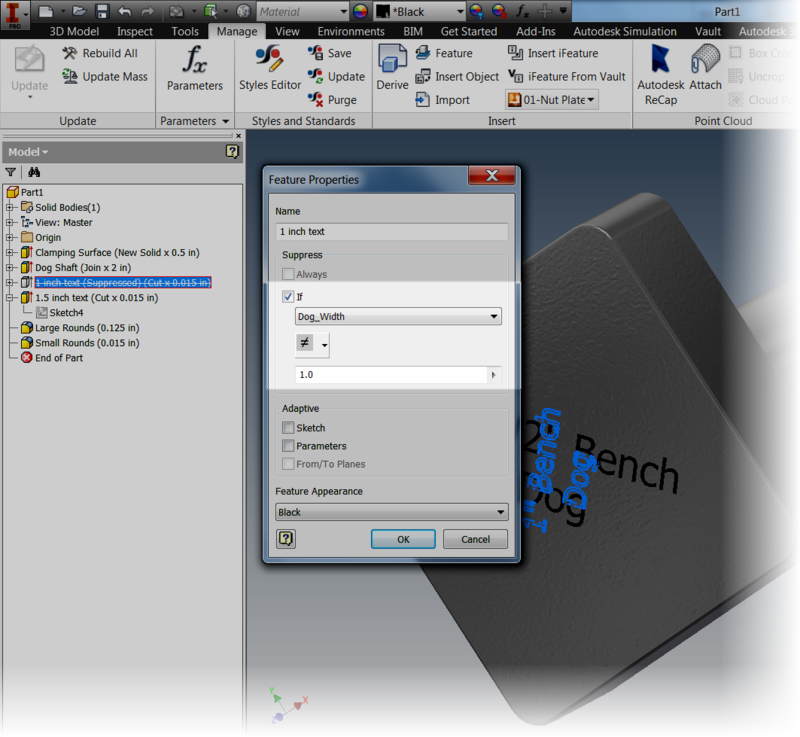 Since I work on several projects that may be quite dissimilar to each other, I have found that it's pretty easy for my Autodesk Inventor materials to get out of sync with the external material libraries. That means, that many times I have to update my outdated or inconsistent material libraries with the current materials in my external libraries. 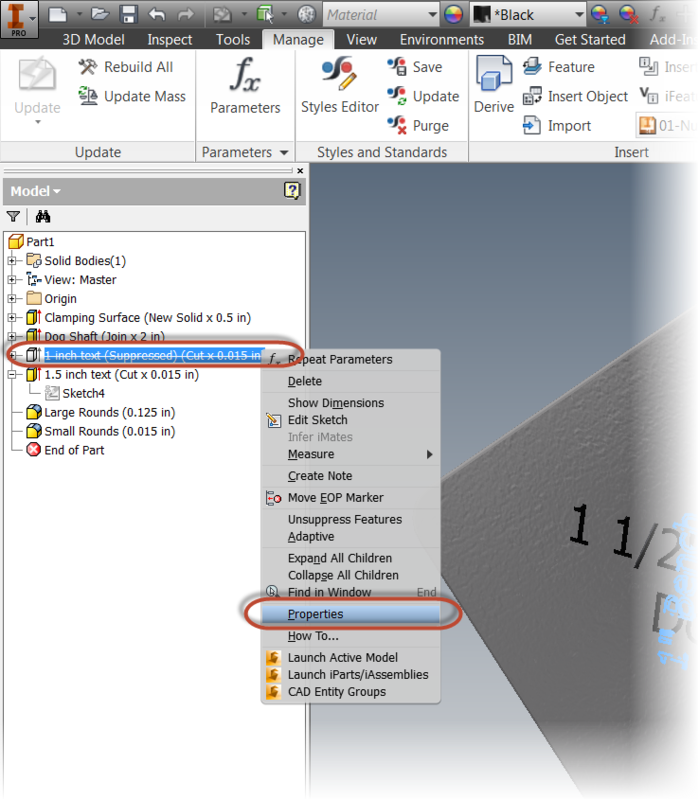 So using Inventor 2014, what's the process of checking, and updating the materials from my external libraries? I'm going to start with a sample part. 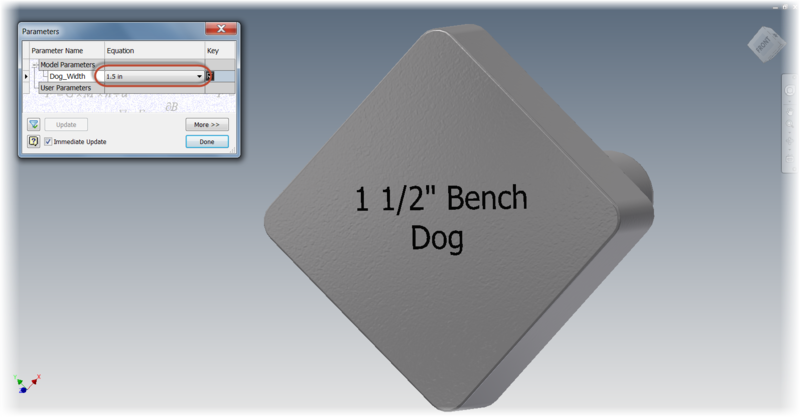 This part came from a different project, and was originally created in Inventor Release 5. So this file has some miles (and migrations) on it! One result of all of this is that the materials don't quite match the materials currently in my library. So I want to update them as quickly as possible. I'm going to open my material library with the icon at the top of the Quick Access toolbar. I can also find the icon on the Tools tab. 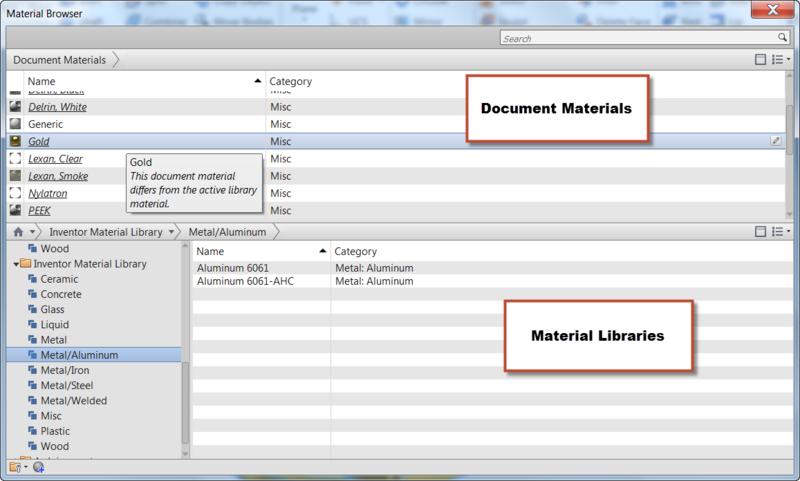 I can see that there are several materials located in the "Document Materials" section. 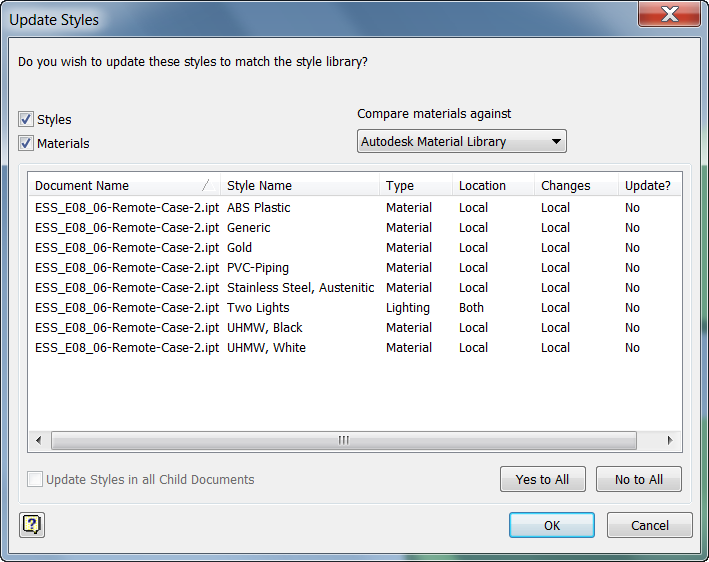 These are the materials that are cached locally inside the file, and over time may not be in sync with the external libraries, which are displayed on the lower half of the dialog box. But how can I refresh the new, with the old? It's a matter of using the Update icon found on the Manage tab, in the Styles and Standards panel. Clicking the Update icon will display the Update Styles dialog box. 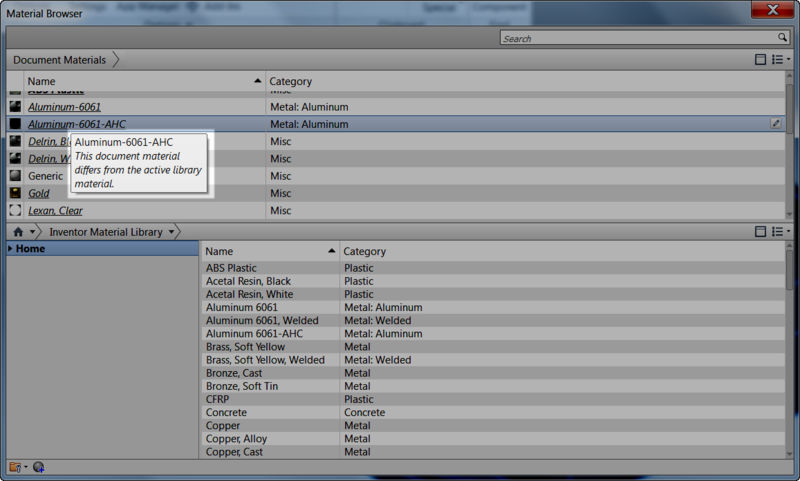 Choosing the library that I want to update, in this case the Inventor Material Library, I can see which materials require updating. A list of materials requiring update. I can click on each material to individually update, or I can click Yes to All and update everything on the screen. For this particular file, I'm clicking "Yes to All". 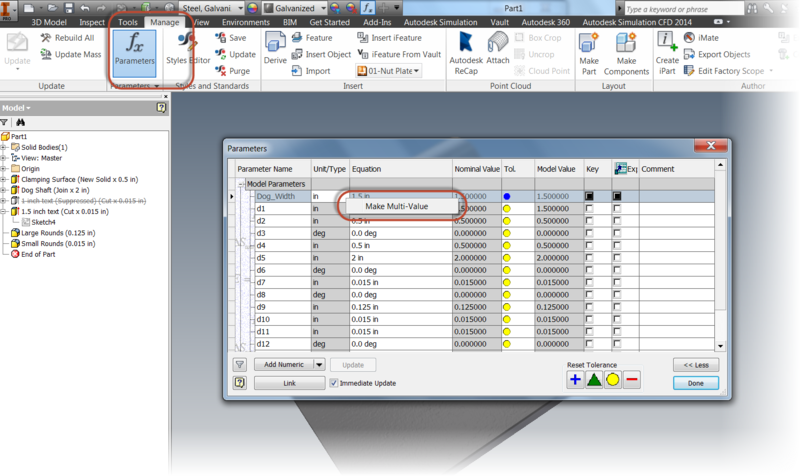 I can then hit OK to update the materials from the external libraries. The libraries are now updated. As a matter of fact, even the active material in the file will be updated, as can be seen in the image below! Now that's left to do is save, and carry on! For a video version of the above post, check out the link below! 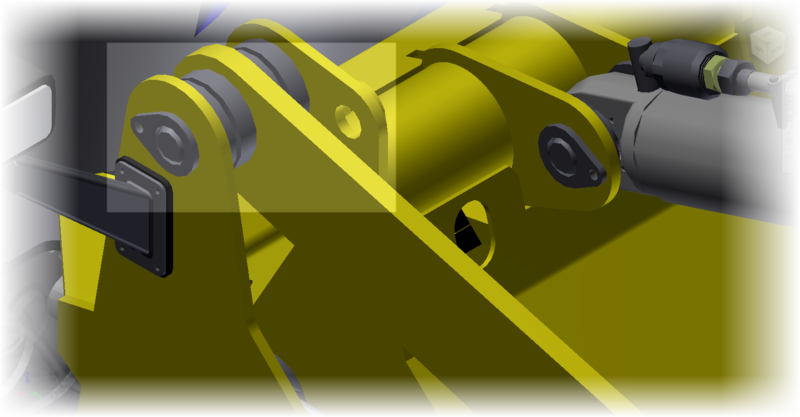 A What's New in Autodesk Inventor 2014 - Creating Self Intersecting Sweeps. I have some friends visiting in from out of town this week, so because of well spent time with them, this blog post is short, and without video. I hope that it is still a helpful tip, even though it is quite brief. In the last few weeks, I've been looking through the what's new topics, and seeing what I like. One of the tools that for my part, I think is going to be really helpful is the self intersecting sweep. 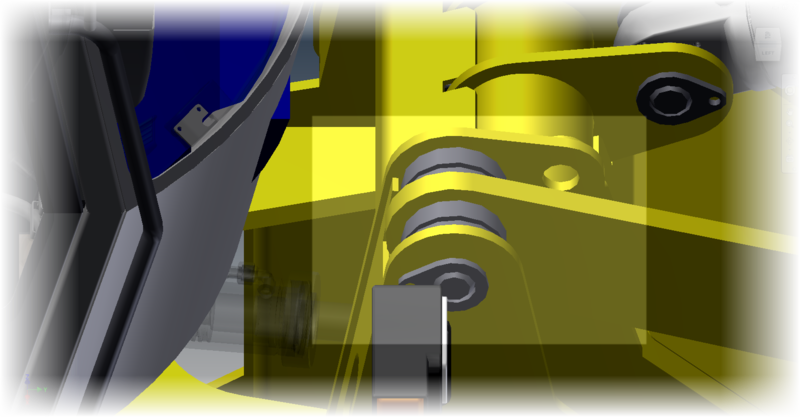 A self intersecting sweep is a swept feature where the profile intersects itself. In earlier versions of Inventor, this sweep would be able to solve. It would error out and fail. An example of a sweep that would intersect and fail. This meant readjusting the profile to make sure it didn't intersect. And while, at least for my part, this hasn't been time consuming to do in the past, there's no beating not having to adjust the sketch at all. 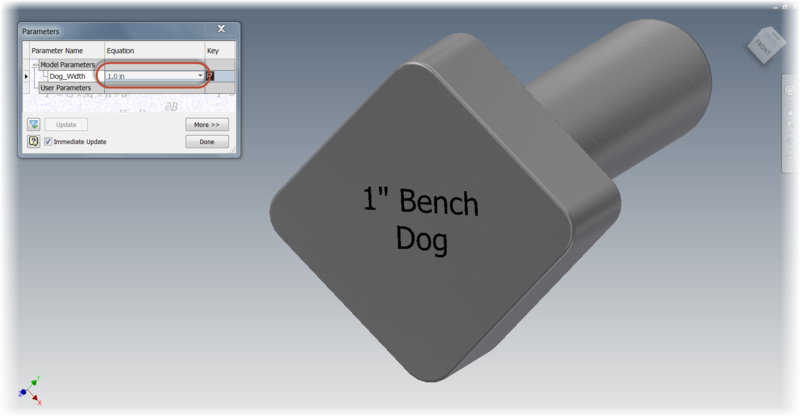 This is where the new Feature in Autodesk Inventor 2014 helps out. As a matter of fact, it helps out a lot. It will allow this self intersecting sketch to calculate, and create itself without erroring out. A closeup of a radius that would have caused a failure in previous releases of Inventor. But now, if I accept and hit "OK", Inventor calculates, and creates this sweep without a problem. How about that! I know that for certain profiles I would use, like router profiles in my woodshop projects, this is going to be a nice feature. 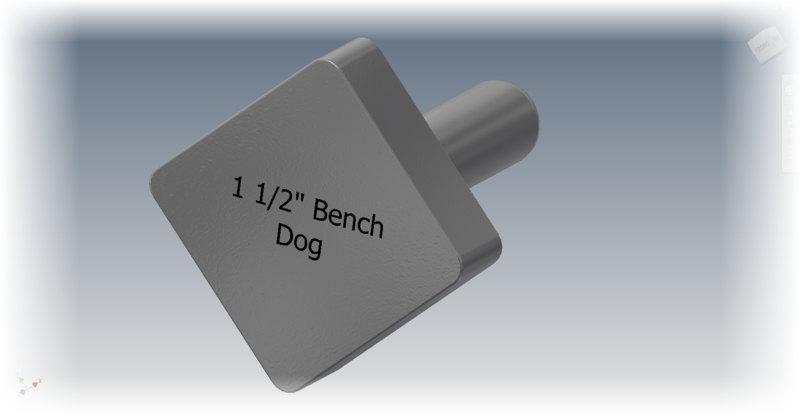 I can make sure that the profile matches the same profile my router bits will give me, without worrying about features that can't be swept because of that. 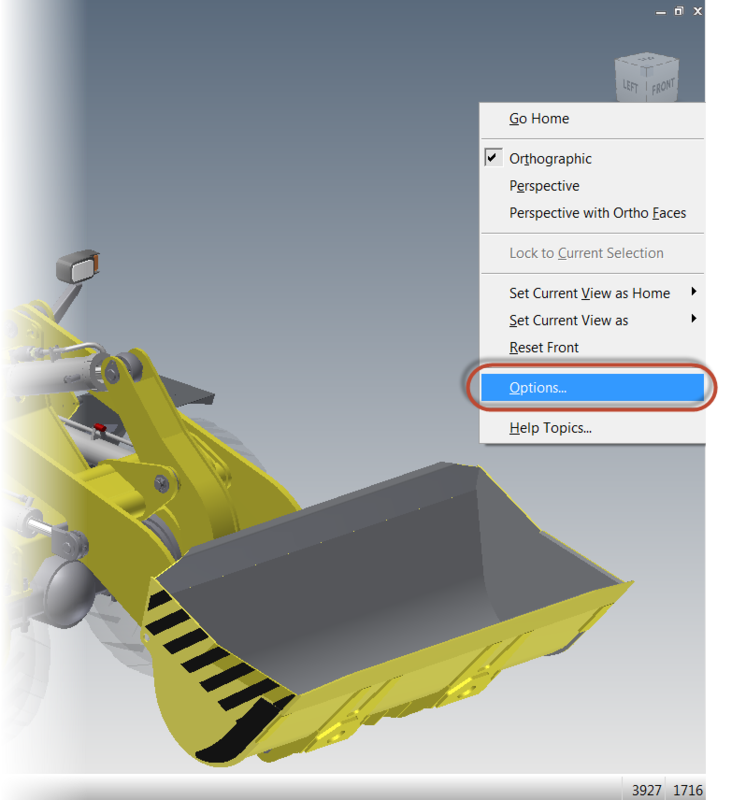 So think about this feature as you move forward into Inventor 2014. 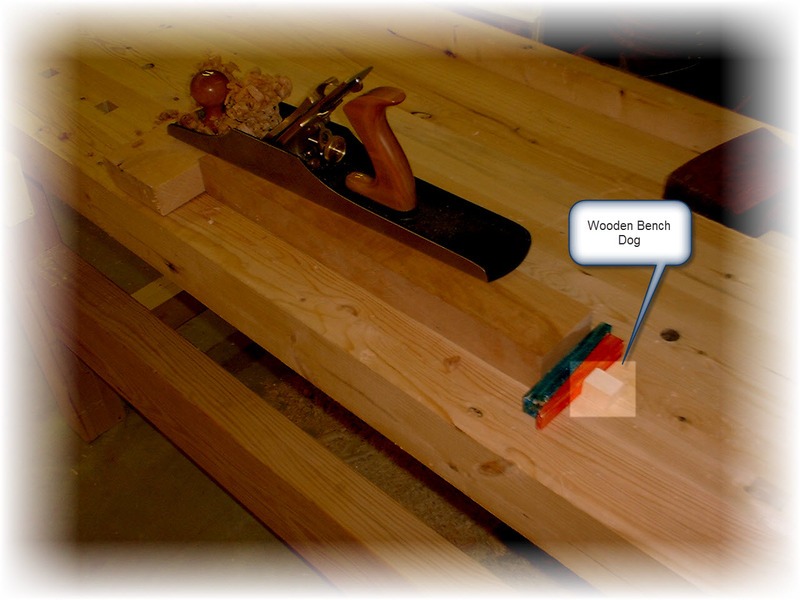 Think of where it can be used for the type of sweep that router profile, where the result is legitimate, but it might not be easy to create because of the profile intersecting. Think about it because, in fact, it just got a lot easier! 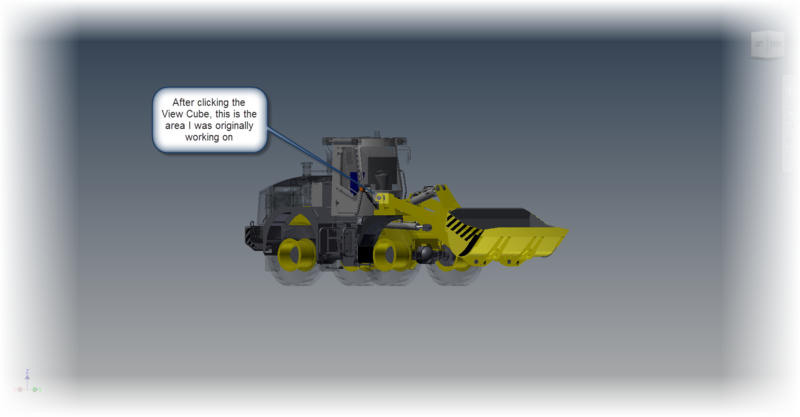 I wish I could say that I had I was the absolute guru in Autodesk Showcase. I wish I could be, to use the corporate buzzword, "the single point of truth". But I'm not, and it would be foolish to presume that I am. There are always things for me to learn and make myself better. Fortunately, there are plenty of generous Showcase users out in "the 'Verse" who are willing to share information with the rest of the user community. For this midweek post, I'm sharing some excellent videos shared by Marion Landry on her YouTube channel. 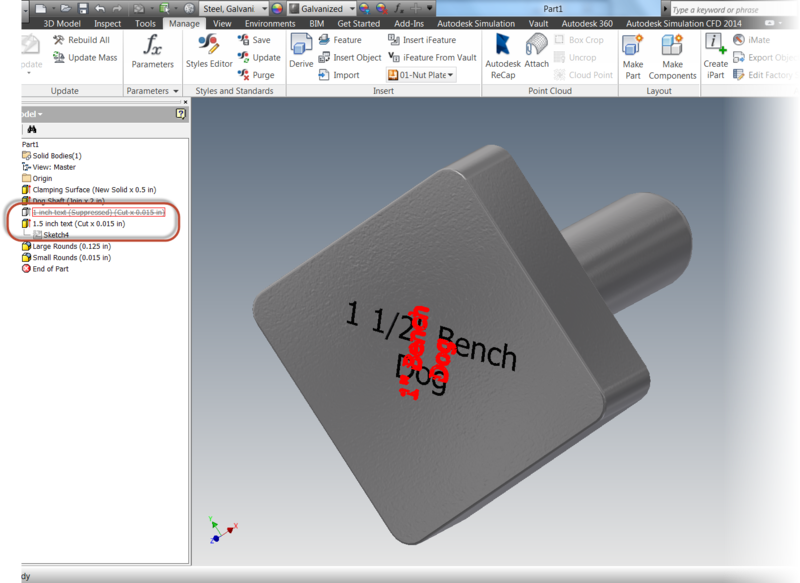 These videos have some excellent tips on using Depth of Field in Autodesk Showcase, particularly with some workflows and tips on using Depth of Field in Ray Tracing and Hardware Rendering. I also like her tips on using shots to save different depth of field views using both hardware rendering and ray tracing, as well as using them in animations! Take a look at the videos! They're a great help!